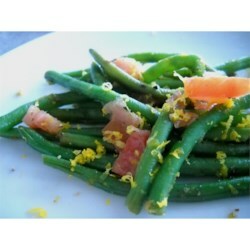 "These sweet-and-savory green beans are a tasty side dish." Stir the honey, orange zest, garlic, soy sauce, balsamic vinegar, pepper, and water together in a bowl. Add the green beans and toss to coat. Allow to soak for 20 minutes, mixing every 5 minutes. Heat the olive oil in a saucepan over low heat; add the green beans to the hot oil and cover the saucepan. Pour the green beans and sauce into the pan and cook, shaking the pan regularly, until the beans are slightly tender, about 5 minutes. Add the tomatoes to the green beans, replace the cover, and continue cooking until the green beans are cooked though yet slightly crispy, about 5 minutes more. Great recipe, and I didn't even add the orange or the tomato bc I didn't have them. I used a little more evoo, but I always double the amt, it's so good for you! Great recipe if you follow the times given. I added some water chestnuts and they took on the taste of the orange zest, a very nice addition. So delicious. Perfect as is.